I learned this great trick this past weekend that is just amazing! As we boil eggs we always over boil! If you have ever had a green ring around the yellow part of your egg that would mean it was over boiled! This is sulfur that has formed from too much heat and if you ever notice your egg will kind of have a sulfur smell because of it. Getting the perfect egg that is bright and yellow with no green is so easy! Place you water in the pot and bring to a rolling boil. Place your eggs in the water and cover with a lid. Boil your eggs for 1 minute and turn off your stove completely. Leave the lid on the top for ten minutes. Let your eggs sit in that hot boiling water. Doing this the heat and the steam do all the work for you and you don't have any green rings around the yolk. 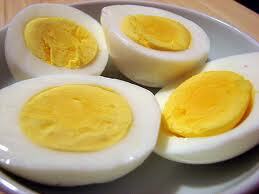 I'm really enjoying boiled eggs... making them in to egg salad. Delish! Thanks--I'll give it a try! I'm sharing my Fresh Strawberry Cream Torte today for my Homemaking Linkup. I hope you'll join us! I would love for you to share this on my Meatless Monday link up. Easy, Fun Power Snacks for Children! Tone Your Arms While You Walk! 58 WAYS TO MAKE YOUR MARRIAGE AWESOME!